A call by the Barreau du Québec to broaden access to legal aid by relaxing financial eligibility thresholds was quickly dismissed by Quebec Justice Minister Jean-Marc Fournier who declared that the provincial government can’t afford to inject more monies into the province’s government-funded legal aid program. Before considering reforms, the Quebec government intends to see through a five-year plan launched in 2005 that confers annual indexation coupled with marginal increases of legal aid eligibility thresholds, added Fournier, who articled at a Montreal legal aid office in 1982. But in a 70-page scathing report entitled “Access to Justice is in Danger,” the Barreau admonishes the provincial government for failing to fully respect its pledge to provide extended access to legal aid for low-income Quebecers. On October 2005, then Quebec of Justice Yvon Marcoux announced with great fanfare that the provincial government intended to grant as many as 900,000 Quebecers access to legal aid services. The provincial government vouched to invest $30-million annually in new funds to gradually raise legal aid eligibility thresholds during the period from January 2006 to January 2010. That hasn’t happened. The number of Quebecers who applied for legal aid services over the past five years ranged between 257,000 and 269,000. In fiscal 2009-2010, the Commission des services juridiques, the agency charged with applying Quebec’s Legal Aid Act, received 269,150 applications for legal aid services, an increase of 1.5 per cent over the preceding year, a rise attributed to the tough economic climate. The commission, however, accepted only 227,216 applications, representing a refusal rate of 14.8 per cent, an increase of 0.3 per cent compared to the previous year. While the legal aid eligibility threshold for single individuals (which make up 73 per cent of the legal aid clientele) has increased by 44.8% over the past five years, from $8,870 to $12,844, access to legal aid coverage has actually diminished, points out the Barreau study. Due to increases over the past five years in minimum salary, from $15,851 on January 2006 to $19,813 in May 2010, less Quebecers are currently eligible for legal aid services, according to the Barreau. In other words, the legal aid threshold of $12, 844 for single individuals represents 65 per cent of the minimum salary of $19,813 – a figure that stood at 68 per cent last year. The study also reveals that the monies the provincial government has poured into legal aid has barely increased over the past five years. In fiscal 2009-2010, the government spent $130.3 million in legal aid, $4.6 million more than in fiscal 2005-2006 – a far cry from its undertaking to invest $30 million annually between 2006-2010. According to the recently published annual report of the Commission des services juridiques, it doled out nearly $42 million in fees and almost $6 million in expenses to 2,086 lawyers in private practice and 142 notaries who handled more than 121,000 legal aid cases. The Commission also paid almost $43 million to pay for the work of its staff of 360 lawyers, who handled 105,000 cases. The Barreau urges the provincial government to immediately tie in financial eligibility thresholds with the minimum wage. 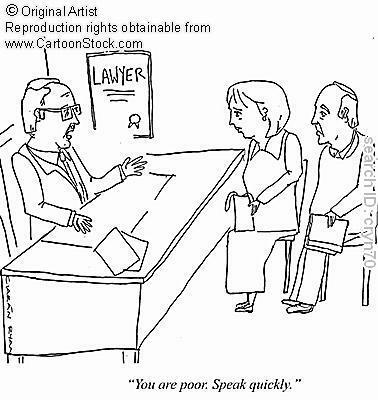 According to a study commissioned by the Barreau that was conducted by two economists, by raising the financial threshold for single individuals to the minimum salary, nearly 300,000 people more would have access to legal aid at a cost of $13.1 million more per year. By increasing the financial eligibility thresholds for individuals and families alike by 50 per cent, it would cost the provincial government approximately $28.2 annually more to finance the system but approximately 750,000 more Quebecers would have access to legal aid services. The Barreau also recommends the provincial government to change its financial eligibility criteria to take into account monthly revenues, and not yearly as is now the case. At present, a person who loses his job may not be admissible to receive legal aid funding if he earned more than $12,844 over the past year even if his “financial situation deteriorated” to the point where he would be eligible if his current monthly revenues were taken into consideration. These changes would lead to cost-savings, even if it is all but impossible to estimate how much, insists Nicolas Plourde, the president of the Barreau’s legal aid committee. “It’s very difficult to calculate cost-savings but one thing is certain having more people being represented by lawyers before the courts would lead to shorter court proceedings, which in turn would cost the State less,” said Plourde. The Commission, however, has not taken a public stance. The Barreau’s report is the latest in a long stream of studies that have called for increased funding and a more innovative approach to the delivery of legal aid services. A report published this summer by the Canadian Bar Association entitled “Moving Forward on Legal Aid” describes shrinking government support for legal aid as a “silent crisis.” Its five-point plan calls for, among things, making legal aid an essential public service like health care. Precisely This is what I was looking for, thankyou for putting it up. Your info really helped me well. I was feeling that my life is coming to an end because of my law problems. I felt the same a few days ago. I felt like a big helpless child alone in this world.